Toddler’s cups are the next stage essential for parenting. Baby Brands Direct always follows the latest trends, but we also often create them. 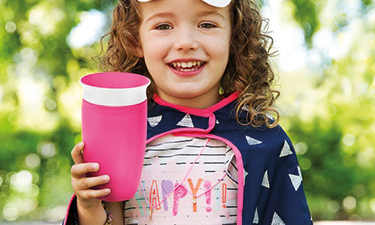 Together with our top rated suppliers, we have been promoting a growing trend of colourful and interactive toddler’s cups. Our catalogue showcases a broad variety of innovative designs in a wide array of shapes, colours and sizes to suit different ages and preferences. You can pick from spouts or straws, handle or open cup, free-flow or valve, cups with a rim valve or angled child-friendly cups with a weighted base. If your target is to sell the extremely popular you have just landed in the right place. Browse through the reputable brands from Philips Avent, Munchkin, Lamaze and Brother Max, to Boon, Tommee Tippee, Nûby and Fisher Price and enrich your merchandise with quality that parents trust. We have been a preferred wholesaler because our clients enjoy selling award winning items with high profit margins. Baby Brands Direct is directing quality brands to your selling place. Our suppliers accord greater attention to safety as much as to innovation. You can now offer a complete parenting package with an ease. With the growing birth rate in emerging markets and demand for premium baby products, our toddler cups’ portfolio has been expanding to cater for the increasing global demand. We are a nursery wholesaler that offers you profit related and fast selling goods. You will also become a baby merchandise specialist who adds value to each item you sell. Just find out more through our comprehensive products’ descriptions that are completely free to use.